Unlike a traditional bike ride through the neighborhood, there’s a whole new set of rules and terminology when bringing your bike indoors. 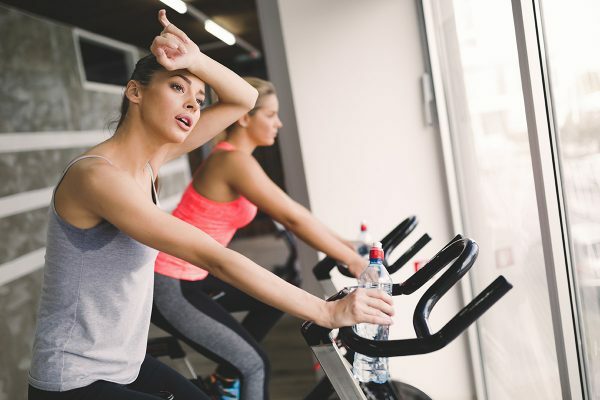 Whether you’re listening on the Aaptiv app, taking a class at a studio, using this popular at home version, or trying it out in your own gym, there can be an intimidation factor when you’re introduced to the world of indoor cycling. While the instructors are telling you to place your hands in different positions or climb on your bike, it may be jarring and difficult to understand. What are all these indoor cycling terms? Have no fear! 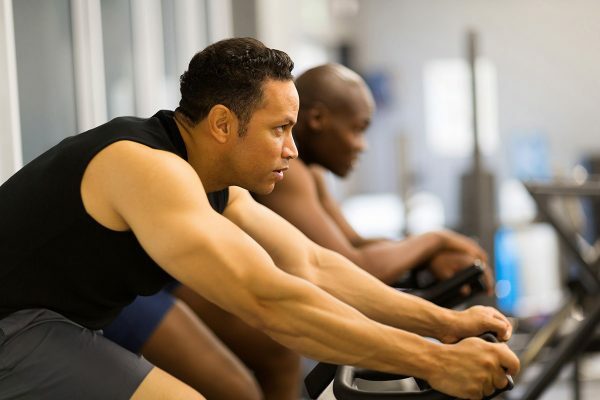 Below, we’ve broken down a list of the standard indoor cycling terms used throughout an indoor cycling workout to get you riding the bike in no time. As the word indicates, this refers to the rate at which more strength is needed to move the pedals. When resistance is high, the slower you’ll go, and vice versa. The part of the bike that controls the resistance. By turning the gear left or right, you determine how much strain you’re putting on the pedals. Oftentimes instructors will ask you to turn the gear. Turning it up means you’re adding resistance (usually a full-circle turn one way). Turning it down means you’re decreasing the resistance. Cadence is used as an indoor cycling term to mathematically break down how fast you’re pedaling. For example, cycling a 60 cadence means your pedals go in a complete circle 60 times every minute. An indoor cycling term used in some cycling studios, a tap back is when you move your bum off and on the saddle in a rhythmic way. By engaging your core, you move two to three inches front and back using the saddle as your guide. It can also be referred to as jumping. When you’re trying to mimic the feeling of climbing on an indoor bike, it’s important to add extra resistance to the gear. Depending on the workout or instructor, you may be off the saddle for some or most of the climb. The logistics of sprinting can vary from instructor to instructor, but it’s always under the premise that you’re moving quickly. Most likely, this means that the resistance level is low and the cadence count is high. This gets your heart rate up and helps you exert more cardio power. During your ride (or exercise), you may be told to place your hands at different spots on the bicycle (we love this best seller), referred to as positions. First position means to place both hands on the handlebars located in the center of the bike. On most standard or indoor cycling bikes, these handles can run perpendicular to the longer horizontal handles. The horizontal handles mentioned above are for second position. These handlebars are longer and curve up. So second position is located on the bottom corners closest to your body when riding the bike. Place your hands where the handles round off and curve upward for third position. You’ll notice both handles spiked off at the top. In third position, place your hands close to the ends of these bars. While your hands are here, you’ll most likely be off the seat (hovering over) with a flat back. Also referred to as the seat. Although a seat or saddle implies you’ll be sitting on it the whole time, this is not the case for indoor cycling. There may be times during the workout when your body hovers over the seat as you participate in different styles or moves. Knowledge of the saddle is also an important part of bike setup. Before a ride, make sure that the saddle hits directly at your hip when standing up next to it. It should never be higher than the handlebars (to prevent any injury on your back or neck). In addition, you need to be properly spaced between the seat and the handlebars so that your fingers graze the first position bars when riding. These indoor cycling terms refer to the specialized shoes (like these best sellers) needed to ride certain types of cycling bikes. These shoes connect and clip directly into the pedals to prevent your feet from sliding out or getting caught. 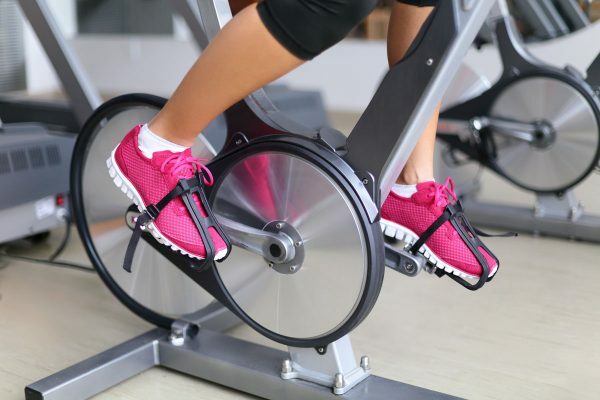 If cycling at a gym or studio with specialized indoor cycling bikes, there will most likely be shoes for rent (so there’s no need to purchase your own pair). For bikes that don’t have the functionality to clip in shoes, they have what’s known as a basket or cage. You can wear your standard tennis shoes and lock them into the bike’s pedals to prevent any slipping. You’ll be going fast throughout the workout! The same apparatus as the gear also serves as your brake. To turn off or stop the bike, push down on the knob (gear) located underneath the handlebars. Now that you know the most important indoor cycling terms, strap your feet in and get moving! Aaptiv has HIIT cycling workouts you’re going to love. Check out the newest releases in the app today.